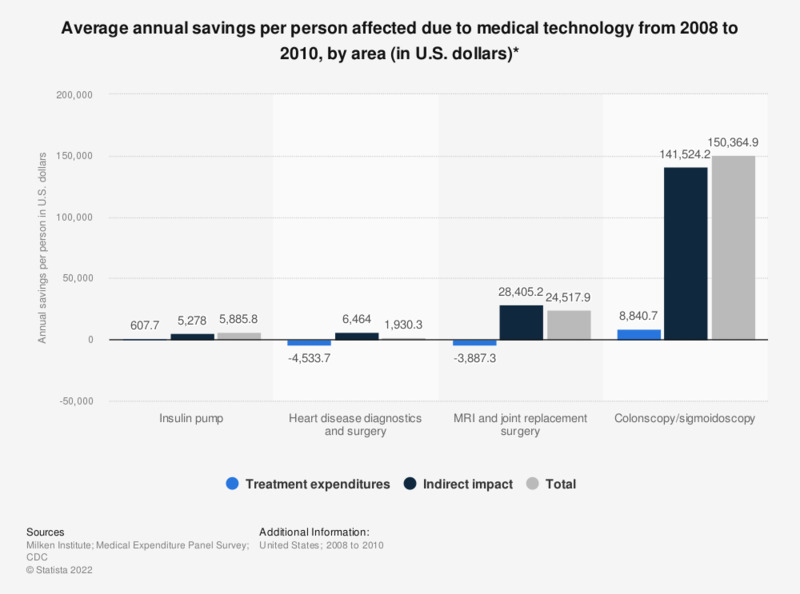 This statistic depicts average annual savings per affected person in the United States due to the use of medical technology from 2008 to 2010, by condition. In this period, insulin pump technologies generated almost 5,900 U.S. dollars of average annual savings per person in total. Although, insulin pump users may have a higher upfront cost than self-injection, however, people who use insulin pumps tend to require emergency rooms less often and avoided long-term side effects such as kidney failure. * Including medical technologies concerning diabetes, heart disease, musculoskeletal disease, and colorectal cancer.